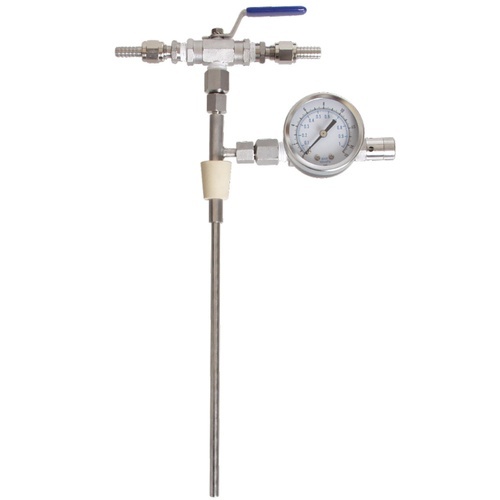 We think our Counter Pressure Bottle Filler is the best on the market, and the Deluxe Counter Pressure Filler takes a proven design to the next level by adding a pressure gauge for monitoring bottle pressure and flared connections for easy cleaning. The gauge on this counter pressure bottle filler allows you to know the pressure in your bottle, an incredibly handy feature. The flared connections allow for easy cleaning as you can connect on or disconnect your lines in a matter of seconds. Traditionally these lines can be difficult to sanitize because they were permanently connected with hose clamps. What is a Counter Pressure Filler? If you currently carbonate and store your homebrew in kegs, you can use a counter pressure filler to bottle beer directly from your kegs. One huge advantage of this method is that since you are bottling already carbonated, clear beer, there will be no sediment at the bottom of your bottles. Counter pressure filling is how a brewery bottles beer. The bottle is under pressure while the carbonated beer flows in. Because the interior of the bottle is pressurized there is minimal loss of the CO2 in solution. The opposite of filling under pressure is when you pour a beer into a pint glass where CO2 erupts out of solution creating all that foam. Great in your glass but not good when you are trying to bottle carbonated beer. Our counter pressure filler mimics a single filling head on a professional bottling line, a concept that we all know works very, very well. Features While some models flush the bottle from the top and fill from the bottom, our unit features a special valve that allows CO2 and beer to flow down the same stainless tube, directly to the bottom of the bottle. First CO2 flows down into the bottom of the bottle to flush from the bottom up. Next you switch the valve position and beer flows down the same tube, filling from the bottom up. The result is a more effective purging of oxygen and no foam during the filling process - not to mention that the whole thing takes one-hand to operate! Why hope that you flushed your bottle properly using a type of beer gun, when you can know for sure that you have created the best environment for your beer to be stored at by using a Counter Pressure Bottle Filler? The unit is inserted into the bottle in the off position. The valve is then turned to CO2 to flush the bottle and then to beer for filling. The adjustable pressure relief on the side of the unit allows you control the speed of fill by adjusting the pressure in the bottle. The valve is positioned in such a way that it is easy to use with one hand, while the other holds the bottle. This model is designed for 12oz bottles but can easily be extended to accommodate larger bottles, such as 22oz, with a small piece of 1/4" tubing. Before you counter pressure fill a bottle make sure you are satisfied with the carbonation level and flavor. The goal for counter pressure bottle filling is to store your beer in the most sanitary and clean environment possible so when you get ready to share your homebrew its presentation is perfect when you go to pour. An ideal set point to set your PSI level on your regulator is 10-14 psi. This range is dependent upon the temperature of your beer and the carbonation level. We recommend you start at a lower pressure around 10psi for the first 2-3 bottles to make sure you get everything dialed in before committing to filling a whole case. Make sure your keg is always kept cold. If your keg warms up you will have foaming issues. Bottling carbonated beverages from a corny keg. Have used one before. Works well. Because I need to fill bottles. Picked this to make the most efficient fills. Need it to make bottling easier. Only the best for my beer. I find counter pressure is the best fill method. This is a nice replacement for my old filler that leaks. Can you dump the entire deluxe model with pressure gauge in star-san without damaging gauge? BEST ANSWER: Hi Jeff - The regulator should not be exposed or dunked in liquid. BEST ANSWER: The o-rings used in the counter pressure bottle filler are 8 mm outer diamter and 6 mm inner diameter. These o-rings are not listed on our site but if you contact our customer service department, they should be able to send you replacements if you reference part number H923. I would check the O ring selection at your local hardware store. What size are the hose barbs? BEST ANSWER: The Beer barb is 3/16". Gas barb is 5/16". Worth noting they are connected by a swivel fitting, so it's very easy to go to your LHBS and swap out the barb if you need, like me, to run 3/16" tubing off both ports. Connected mine to standard beer line. 3/16 ID I believe. Iis the keg itself hooked up to a separate CO2 line? BEST ANSWER: Hello Steve - Yes, the keg will need it's own line. However we offer KEG803 as an accessory kit that supersedes this. Like it a lot, easy to use and the bottles get a lot o pressure. This was easy to use on both 22oz and 12oz bottles. This works very well. Absolutely no complaints after bottling 5 gallons. First off: it works, and it works pretty well. I needed something better than a picnic tap and a tube for bottling root beer and preserving the carbonation. I tried using a stopped and easing off the seal to make my own version of a counter pressure filler, which kinda worked, but I broke two picnic taps in the process, made a big mess, and it was just all-around clumsy. This does a much better job. I docked a star because it's kinda tedious to fill bottles this way; the tube is a little bit too long (In fact, it had poked through the box during delivery. And as it is, it's a little long for 12oz bottles and I have to set it at an angle to get the stopper to seat. I'll probably cut a quarter or half inch off the tip of the tube); and the stopper seems a tad soft. But it does what it advertises, and now I have bubbly bottled root beer. Fills bottles fast and with just the right amount of head space each time. Only issue I have is that the valve does leak some CO2 when in the off position. The unit is fine but the instructions could have been clearer for a first time user. It took some trial and error to get it right. Works great. Contact between rubber stopper and tube could be tighter as there seems to be some leakage, but not a big deal. I just received this yesterday and was a little disappointed there was no stopper in the package as advertised. Now I have to purchase a stopper before I can try it. Other than that it seems like a good piece of equipment. (1) Throw the whole thing, with your bottles, in with your beer the morning you're going to bottle. If everything is at that same cold temp, your foaming issues will be minimized. (2) Heed instructions about maintenance. There are easy ways to adjust and maintain the pressure relief valve and the 3-way ball valve that sits atop the unit. I've read other reviews of people who had small issues with these parts - but it's clear they didn't read the instructions, unfortunately. (3) If at all possible, get a partner to do the capping. It is worth putting off for a day if you can have that extra set of hands around to help. (4) Relax, don't worry, and have a homebrew! botling have always been dificult and tedius for me, counter presure bottler filler works well but still is a hard work, but I recomend it is better than noting. Works pretty well. Really helpful too if you over carbonate your beer. It takes some time to get the gas and beer lines set up, but then bottles can be filled quickly and easily. The check valve is rather touchy - only minor rotation of the control nut is required. Naturally, be sure to clean it well after use as any remaining beer will prevent proper functioning. I really love this for sure, this works excellent for my operation. I am able to fill 10-12 bottles off each keg so I have a few around to take to friends and various tastings. I have had some of the bottles for a couple of months in the fridge, when I open them they are keg perfect. actually smother since they seem to have even more time to age. I am very happy with the product. Make sure you have a cold keg going in and the bottles fill fine, make sure you purge first and fill to the top, I use a try under the bottles to catch any spill. I give this product a five star for performance, ease of clean up and quality. Good job More Beer on this one! When I first got this bottle filler I wasted a good half dozen 22oz bottles of beer before I realized that the pressure relief valve wasn't installed properly. Essentially I could not get the bottles to hold pressure. The valve was always partly open so there wasn't enough counter pressure in the bottle to prevent foam from forming and I was basically pouring a lot of foam. Once I realized that there was an issue I unscrewed the relief valve cap, removed the spring, and realized the valve was crooked. After several attempts I was able to straighten it with my finger, drop the spring over it, and screw the cap back on completely. Finally the bottle would hold pressure and I was able to pour pretty much foam-less beer all the way to the middle of the neck. I've bottled about three cases of 22oz bottles at this point and this bottle filler really works great. It's just a shame that the check valve requires such care in order to seat properly. I just opened mine and used it for the first time. It made filling bottles from a keg a breeze. The only complaint I have is where the pressure relief valve is hooked onto the stem seems fairly loose. I don't know if it is supposed to be this way. I was thinking it would be connected pretty tightly, but it wiggles about a 1/4 inch in any direction. Bought this with the intention of bottling a few quick bottles to send to my brewing partner. Hooked up as per instructions and followed directions to purge and fill bottle. The first thing i noticed was that the check valve would not shut off the CO2 completely so I fiddled around with it trying to get it to seat. I finally thought "well maybe its not supposed to shut off completely". WRONG. After spilling way too much beer, making way too big of a mess and losing my temper in a big way. I decided the check valve was designed by an idiot! I'm a mechanic and I make my living working with hydraulics, valves, check valves, pressure relief valves and the like. I've never seen anything so cheap and ineffective. The seat of the valve is designed so that it can easily go in crooked (nothing to guide it to its beveled seat) so it is virtually impossible to get it to seal. I never did. I finally took it out and used my thumb to seal the outlet and regulate the leakoff, it was only then that i could fill the bottles. Why don't you just skip the relief valve and install a ball valve that can be opened to the desired leak off volume. Additionally with a valve and a hose barb you could direct the leak off to a bucket and eliminate the mess. I have been happy with all the product I've bought here up to this one, but when you spend $90 on something all the components should be quality... or the design should be changed. One star for a very very frustrating experience! The jury is still out... I paid for the deluxe version and could not get a reading on the pressure gauge but the bottle was pressurized. After disassembling the filler I discovered that they had not drilled out the hole between the stand tube and the pressure relief tube. Because pressure couldn't bleed off through the relief tube, it started leaking through the valve stem instead. I'll repost if my experience improves after drilling out the hole. For $90 I expected better quality. Once you get it down it is the best! I know and trust that my bottles are carbonated to the right pressure I need. I use my double regulator off one of my CO2 tanks and hook one regulator side up to the bottle filler and one up to the keg and set the desired bottle pressure on the filler and then do about 1 psi less on the keg and has work well for me! I use to bottle and would enjoy being able to give bottles of beer away. But then I got into kegging and bottling went away for me. I would invite friends over but sometimes my buddies wouldn't be able to visit in time before the keg was empty. Then I found this gadget and it works great, I can fill bottles from my keg and be able to put some away for my friends before the keg is tapped out. Recommend this item if you enjoy giving away bottles of beer but prefer to keg instead. One of my favorite brewing gadgets. If you have kegs, get one of these! After a few weeks of cold conditioning and carbonating in the kegs, fill some bottles. This way you can carb to you liking and the end result is super clear beer with no sediment! Takes a little practice, but worth it. It takes a few bottles to get your rhythm down, but it does the job! Made a sloppy job very easy. This is the best way to fill bottles and the closest thing to the pros you can find. Instructions are clear and very easy. After a few tries getting the hang of regulating the pressure, I filled a case in no time flat. Hightly recommended. I'm glad I didn't post a review before I got the hang of using this filler. Sure, I sprayed a little brew around a couple of times. But now that I have the pressure properly set and I know how full to get the bottles, this thing is great. I get very little overflow and it's a snap to use and clean. I highly recommend! This filler is worth every penny! I use to haul my keg and CO2 tank with me if I wanted to bring some beer with me to a buddy's house. It is so nice to be able to fill up a quick six pack and be out the door in 30 minutes. Sure I could naturally carbonate, but who wants that yeast sediment in their finished product. Not me. Also, in my opinion the deluxe is worth the difference because the gage on there really helps you quickly throttle the pressure release valve to the same pressure with every bottle. A must buy for anyone with a corny keg setup! Once you figure out where and how to connect all the hoses this Deluxe Counter Pressure Bottle Filler works great. I suggest the deluxe one specifically because with the pressure gauge you can know, and document, exactly the pressure you are filling the bottles up at. I have found this handy for consistent filling for competitions and for friends. I only have 2 minor complainants; one, after filling up 50 bottles or more my hand starts to cramp because of the shape of the filler, and two, the gauge is hard to keep in good condition after a fair amount of use. However, because this works off a kegging system I don't bottle all my beer and the way this filler is built you can easily buy replacement parts if needed. This, again, is a darn-near perfect bottle filler and I highly suggest getting the deluxe version for the pressure gauge. I've had this for a while, but just set it up two days ago. I took me one, 3-minute YouTube video and one try to make this work well. My only trouble is, I'm filling Boston Rounds and the bung was not the right size. Luckily I had another and could make it work. I bought the CP filler with the pressure gauge. I did not want to hassle with fitting this together from parts, plus, it would have likely cost the same or a bit more, not including my time. It took a couple of bottles to get used to working with it, and now I find it easy. I do wish there was such a thing as a waterproof pressure gauge! I did actually drop it in my sanitizing solution a couple of times. No worries, it still works fine. I recommend watching the video that is recommended as it is very helpful and got me started quicker than without. Great CP filler, I highly recommend this product for all kegging homebrewers that want to bottle a few from the keg for contests and such and maintain the correct carbonation levels. Fred B. Got kegs? This is your answer to competition entries, gift giving, bottle(s) for the camping cooler. This little gem works like a charm. May take a couple tries to dial-in the right pressure but when you do...watch out! All your brewing buddies will be envious. Let 'em give it a try...you won't regret it. Mine leaks through the top valve and I can't stop the leak. Not a huge deal, a couple drops per bottle. Also, it's a pain to depressurize slowly so the bottle doesn't foam and then you have to remember to tighten up the PRV before the next fill otherwise you spray beer everywhere. Overall, better than I could have made by myself for that price but it does leave some things to be desired. Being new to kegging, it took a few tries for me to fill a bottle without spraying my entire kitchen from floor to ceiling. The instructions should mention that you should never try to reinsert the wand into a partially filled bottle! But once I got into a groove, using just one CO2 tank, I was able to fill two cases of 12 oz bottles all with exactly perfect carbonation and very little yeast sediment. Over an entire batch of beer, I don't think counter pressure filling is any less work than priming and bottling. You will get the carbonation you want, though - which is especially tricky when bottle carbonating higher gravity and super attenuated sour beers. And you have the option of bottling just some of the batch and leaving the rest in the keg. Perfect bottle filler or growler filler with little to no foam. I operate this filler off of one Co2 source with no problems. I could see the benefit of using 2 but so far for filling 12-24 bottles its great! For filling growlers I slide on a bigger size bung and proceed to filling it the same as I would for a bottle. Big thing to remember is the flow rate of filling and amount of possible foam depend on how much Co2 your release as to drop bottle pressure, but you can adjust on the fly. Also, after filling and when you have turned the beer fill valve into the off position, continue to release the rest of the bottle pressure from the bottle by using the pressure release valve before you remove the bung and fill tube, otherwise you might get a little beer to spray from the remaining bottle pressure. Other then that, nothing but great fills with perfect C02 pressure and oxygenated beer! Cheers! Been using my filler without a problem. Perfect for filling a few botttles to share or submit for homebrew competitions. The design using only one valve and including the pressure gauge so you don't make bottle bombs used makes this filler superior! After you fill a couple bottles and get the feel for it, it works like a champ! I plan to use it for entering competitions and traveling with my home brew over the holidays. My family and many of my friends live 5-6 hours away and I have always had to bring a cornie with me or fill a bunch of growlers to share my creations over the holidays, and let's face it, the carbonation just doesn't hold up. Thanks for the great new gadget! Great solution to fill competition and gift bottles. This device does take a few trys to get the hang of it, but once you figure out your pressure settings it gives you results. I keg all my beer and use this to fill individual bottles for competitions or to give away as gifts. I found the device foams when you have to fill bombers since the stem only reaches down about 3/4 of the way, but other than that it has minimal foaming if you keep your PSI below 10. Buy this product! You won't be dissapointed. I bought this product to avoid the sediment associated with bottle conditioning and could not be happier! I can consistently dial in my carbonation profile and then have clear carbonated beer when I share it with friends and family via bottles. The ability to purge the bottle is an invaluable feature! This has been a great buy for me. The only thing when you watch the video on this you will see a samll clam above the cork. If you do this it will help the cork from moving. Other than that it is great. This is the only counter pressure bottle filler that I've used but it works great. I had to watch the MoreBeer video for a demonstration, but after that (and a few trial runs), I've got the method down. I appreciate the threaded fittings for swapping out the beverage and gas lines on this unit and the pressure gauge comes in pretty handy as well. Do take care to keep all of the parts intact though. I once almost lost the little spring inside the pressure release valve. I have used several other fillers  from home made to brand name. This one ensures a minimum of O2 pickup and allows you to control flow and, therefore, foam. It takes both hands to operate so I mounted mine on a piece of MDF and attached that to a hinge. The other side of the hinge is mounted to a wall so the entire unit can swing out, allowing me to insert the stainless tube into a bottle, then place the bottle on an adjustable shelf (for 12 oz and 22 oz bottles) for the filling process. This frees both my hands to operate the filler and my capper seamlessly. This is useful for bottling from a keg but be forewarned. Mine was put together a bit sloppily with loos fittings. Took me a call to the manufacturer and a trip all the way back to Concord to find this out and get it working. To fill those shorter bottles (I got a lot of Sierra Nevada bottles) I slipped a 1" long piece of 1/4" ID tubing onto the shaft then slid the #2 bung onto that. Drilled bungs always have a 3/8" hole for airlock, and I didn't feel like drilling my own. This works. Best counter pressure filler on the market. It took me three tries to get it right, but I did essentially the same thing that the previous reviewer did (not knowing this, nonetheless). If you have two different sources for co2, it works like a charm if you st the pressure slightly less than the keg pressure. I even found that the carbonation in the bottle was better than the keg, and head retention had improved. I hate bottling full batches of beer, but don't mind bottling a 6 pack or 12 pack to save for later with this thing. I can't wait to use this in combination with some sort of beer filtration system that I will purchase in the near future. The only thing that morebeer could improve on, is to make the instructions a little more detailed for those who are just entering the kegging world. If you have the PSI set too high like 10-15 like the instructions say, you will shoot beer all over the place. It would seem that some of the benefits of CO2 counter pressure filling would be negated with this process because when you remove the bottle filler, it's volume inside the bottle will be displaced with ambient air. I understand that foam may continue to rise (depending on the carbonation level of the beer), but it does seem like ambient air is hard to avoid with this process because you are sticking something inside the bottle that needs to be displaced once removed. Any comments on that? I have seen bottling lines at breweries and one of them would drip a little bit of water into the bottle to make the beer foam up so when it was capped the foam inside would be co2. Also co2 is heavier then water so if you have purged the bottle effectively and have foam when you cap then you should have all CO2 in the beer. Even if some air got into the bottle the co2 in the beer would have a higher partial pressure, you can think of it in the range of 5-8:1 because your beer should be carbonated somewhere in that range. There shouldn't be enough oxygen to oxidize the entire bottle.